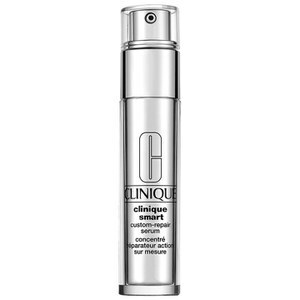 Improve the appearance of your skin with Clinique's Even Better Clinical Dark Spot Corrector + Optimiser, a brightening skincare system with dual-chamber delivery. Promoting a more even skin tone, the product combines a clinical-strength serum (with CL-302 complex) with a calming optimiser to help diminish dark spots and pigmentation whilst relieving skin and boosting resilience to help prevent future darkening. Brightening the complexion in just one week, the bi-phase solution promotes long-lasting radiance and improved skin tone. The dual-chamber pump dispenses the perfect balance of each fluid for maximum results. 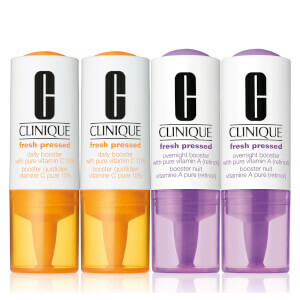 Free from parabens, sulphates, phthalates and fragrance. Allergy tested. Use twice a day, morning and night. 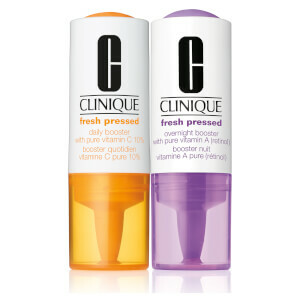 Dispense 1 to 2 pumps onto fingertips. Spread serum all over your face and neck. Follow with moisturiser. Daily sunscreen is imperative. Water\Aqua\Eau, Dimethicone, Butylene Glycol, Isododecane, Cyclopentasiloxane, Polysilicone-11, Ascorbyl Glucoside, Tromethamine, Pentylene Glycol, Curcuma Longa (Turmeric) Root Extract, Morus Bombycis (Mulberry) Root Extract, Cucumis Sativus (Cucumber) Fruit Extract, Betula Alba (Birch) Bark Extract, Scutellaria Baicalensis Root Extract, Trametes Versicolor Extract, Narcissus Tazetta Bulb Extract, Triticum Vulgare (Wheat) Germ Extract, Morus Nigra (Mulberry) Root Extract, Molasses Extract\Saccharum Officinarum\Extrait De Melasse, Citrus Grandis (Grapefruit) Peel Extract, Hordeum Vulgare (Barley) Extract\Extrait D’Orge, Salicylic Acid, Oryza Sativa (Rice) Bran Extract, Algae Extract, Caffeine, Gentiana Lutea (Gentian) Root Extract, Vitis Vinifera (Grape) Fruit Extract, Saccharomyces Lysate Extract, Camellia Sinensis Leaf Extract, Yeast Extract\Faex\Extrait De Levure, Hydrolyzed Prunus Domestica, Sorbitol, Cholesterol, Phospholipids, Dipotassium Glycyrrhizate, Di-C12-18 Alkyl Dimonium Chloride, Squalane, PEG-10 Dimethicone, PEG-6, Glycerin, Sucrose, Polysorbate 20, Tocopheryl Acetate, Isohexadecane, Acetyl Glucosamine, Propylene Glycol Dicaprate, Arginine, Helianthus Annuus (Sunflower) Seedcake, Sodium RNA, Caprylyl Glycol, Dimethoxytolyl Propylresorcinol, Glycyrrhetinic Acid, Sodium Hyaluronate, Polysorbate 80, Ammonium Acryloyldimethyltaurate/VP Copolymer, Acrylamide/Sodium Acryloyldimethyltaurate Copolymer, Carbomer, Potassium Sorbate, Sodium Hydroxide, Sodium Sulfite, Sodium Metabisulfite, Hexylene Glycol, Disodium EDTA, Phenoxyethanol, Yellow 5 (CI 19140), Yellow 6 (CI 15985).